Top-notch choice! The cover letter is a critical component to your marketing package. Don’t overlook this too. Correctly written, the cover letter is among the most valuable personal branding tools in your marketing kit. It can make the difference in defining your brand and is critical to express how you are the best match to the opportunity. Simply put, it tells your future employer how and why you are qualified, and why you are the right person for the job. This custom-made letter is designed to showcase your qualifications, strengths and highlights that will make you stand apart from the competition. It’s exceptionally priced for just $69.95. Don’t delay, order your letter today! Just like the resume, first impressions really count. Your cover letter is intended to complement your resume in selling your professional background and experience so it will entice the employer to call you for an initial interview. It formally introduces you and quickly tells your story. In fact, the cover letter is the “directions” page that tells the employer where to find the nuggets in the resume. It guides them to the spots in the resume that truly highlight your experience, knowledge and skill set that specifically match up to the job. That’s why it’s so important to have a well written cover letter; an art often lost in today’s environment. Conveys your communication skills and abilities: particularly your writing ability. It also demonstrates your communication abilities. In an informal communication age where writing skills and style are often a lost art, a well written cover letter conveys excellent communication skills. It’s something that often translates into good speaking and presentation skills; a critical component in any profession. Our professional writers know how to tell your story through a well-written cover letter. It will be clear and concise, look good and pleasing to the eye, and inviting and easy to read. 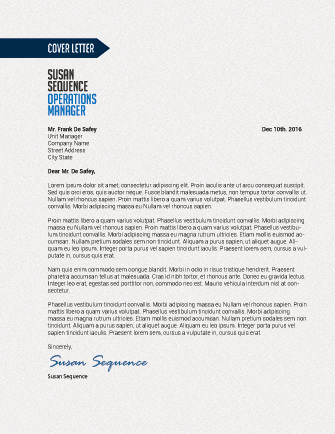 Why a Sequence Cover Letter? We interact daily with some of the most well-known and respected employers throughout the U.S. and around the world, we know and understand what employers are looking for in a job candidate. It’s why our products and services are so successful at capturing their attention and can significantly increase your brand awareness in the job marketplace. We customize every cover letter for the job you are seeking. Generic cover letters simply don’t work. In fact, they work against you because employers can perceive that you simply don’t care enough to put the effort into producing a letter that tells them in a compelling, articulate manner how your qualifications fit and why you are the best match to the opportunity. Our tailor-made cover letters will make a difference and truly help you to stand apart from the competition. Our professional writers know how to market your knowledge, experience, skills, and other key characteristics and attributes in such a way that they garner the attention of employers. After all, the purpose of the cover letter is to convince the employer/recruiter that you are the right person for the job. It’s why a Sequence cover letter stands apart. Our expert professional writers know how to craft letters that have been described “as bold as they are innovative.” We know how best to incorporate key words, utilize action verbs and adjectives, how to best adapt the cover letter to the job you are seeking, and how to tell your story in the most compelling way. Our years of experience expertly combining these key ingredients to produce powerful letters is what sets Sequence apart, and is why our cover letters will increase the odds that yours will capture the attention it deserves. Once you contract our services, you will be assigned to a professional with vast experience recruiting, branding and marketing job candidates; who works closely with employers recruiting and screening candidates and resumes; has a proven track record producing thousands of resumes and other vital personal brand materials; possesses a keen knowledge of the employment landscape; and is a highly capable career planning and development consultant. All of our cover letters are produced in MS Word and/or PDF formats.